Being Swedish and having lived my whole life with Mora knives which are typical of the traditional Nordic knives with their simple grips, flat “Scandi” grind and very sharp edges that are wonderful for everyday outdoors chores, I am very much coloured by that background when I look for knives, and finding knives that really beat that simplicity regardless of price isn’t so easy to do, while at the same time Mora, up until quite recently, have stuck to their principle of keeping things plain and very affordable, meaning there has been no real good option for anyone looking to step things up a bit either. Now, I am quite lucky to have had the opportunity of testing a ton of knives from all over the world, ranging in price from about 15€ to several hundreds of euros. 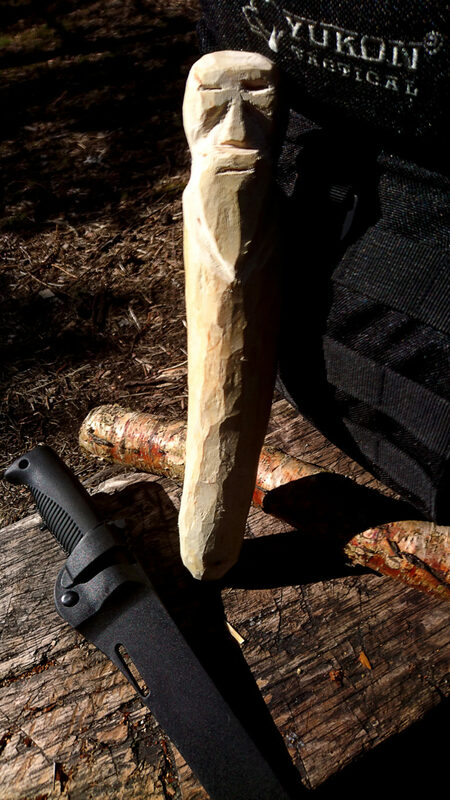 Most of them have been designed specifically for bushcrafting and/or survival and out of all of those, a few have crystalized as being above the rest. Today’s knife is certainly one of them and is, since a while back, one of my clear all-purpose favourites. 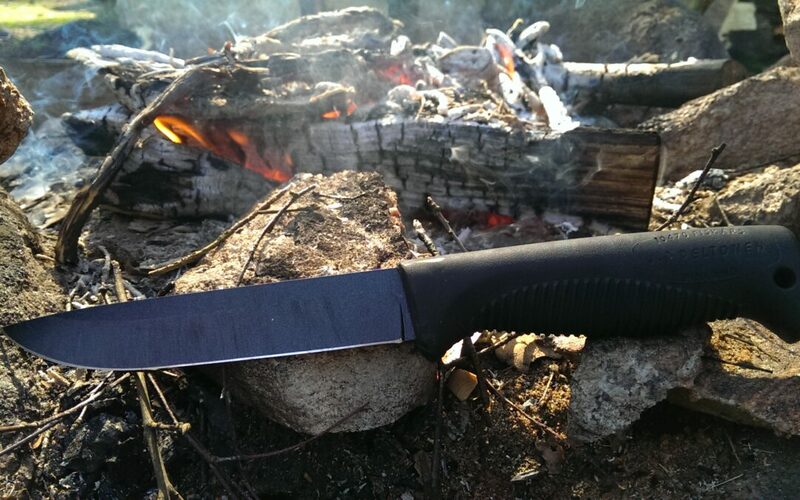 The Sissipuukko m95 was at first a collaboration of two parties: The company Fiskars Oyj Apb, which originally comes from Fiskars village, just north of Raseborg, Finland, and which today is a large, international company employing more than 4300 people worldwide. Fiskars has manufactured pig and wrought iron ever since 1649 and common products originally were nails, thread, hoes, iron wheels and knives. Simply put, the company has some extensive experience in producing quality steel for knives and other cutlery related items. And for that reason, they were chosen to deliver the blade blanks for the knife. Fiskars, however, were not the designer or even maker behind these knives. Instead, the Sissipuukko are the invention of Cpt. Juha-Pekka Peltonen. And with the current version of the knife, Fiskars is no longer part of the picture as the blades are nowadays manufactured by Laurin Metalli in Kauhava, Finland, a town quite famous for knife making since centuries back. The Fiskars mark on the blades today only refer to the village of Fiskars, which is where Cpt. Peltonen lives, or rather a few klicks outside of it. (It is a common misunderstanding that the 10470 number on the grip refers to a catalogue number of the Fiskars company, but it is actually the postal code of the village). Although no longer in it, Cpt. J.P Peltonen used to serve in the Finnish army and, like my own father, also served as a UN soldier in Cyprus, and in Sinai, in the UN Observer Group in Lebanon, and in Kashmir. 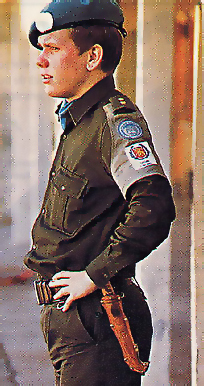 In Lebanon he was introduced to the famous Randall knife from a US officer, and he soon ordered one for himself. After having come home to Finland Cpt. 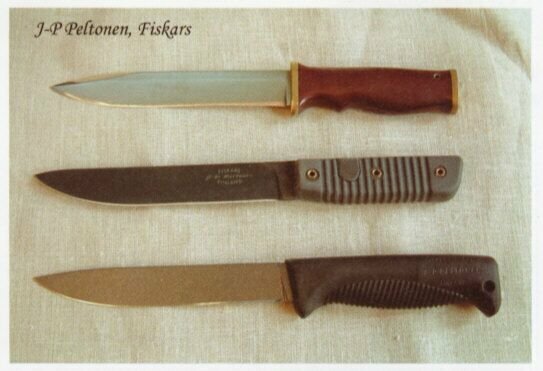 Peltonen decided to design and create his own knife, as seen to the left. As a sidenote, this design was also recreated as a custom order in 2015, by Cpt. Peltonen’s friend and knife maker Pekka Tuominen. Later, in 1989, he would meet with the Commander of the Finnish Spec Ops units who came to visit him, looking for a strong knife to equip the Finnish Rangers with. 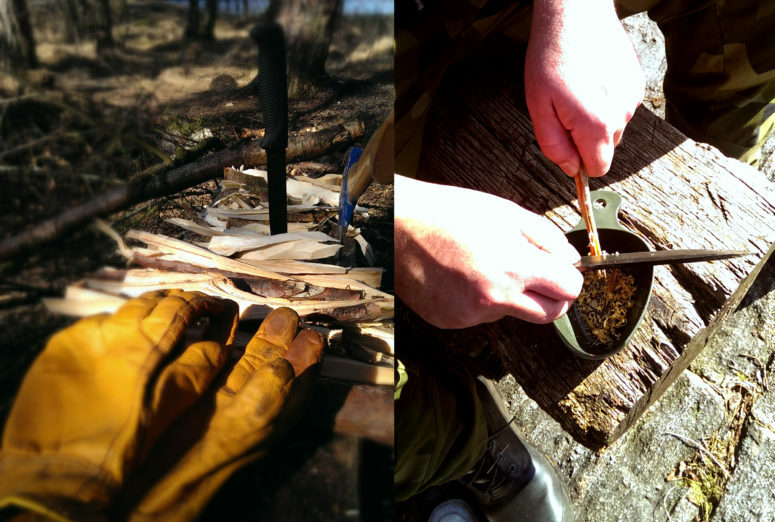 And it is from this that the Peltonen Sissipuukko (Finnish for “Ranger Knife”) would come to evolve. The first to adopt it however, were the Swedish Special Protection Group, SSG, a special ops unit within the Swedish military. 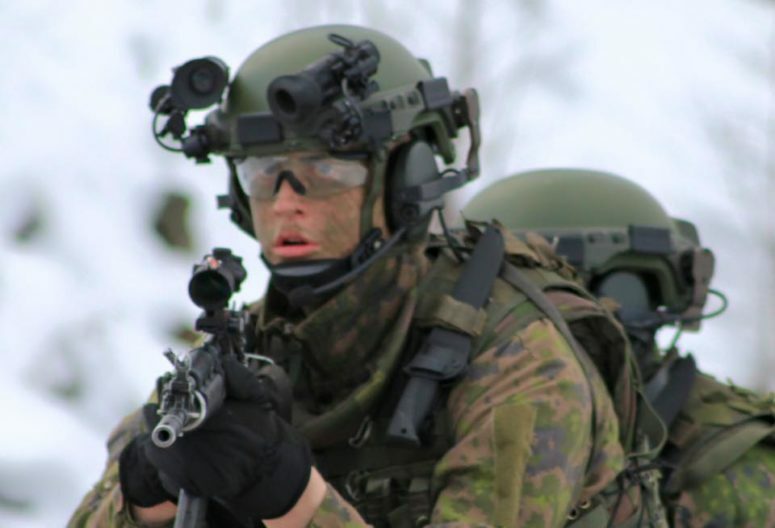 Since then both the Finnish as well as UN and US troops have tested it heavily and approved of it, as has Special Forces from a number of other countries around the world. Striving for perfection, and using the same method used for making the samurai katana, the old version of this knife used forged blades that were made from differentially tempered high-carbon steel with the edge and spine hardened and tempered to different hardness, with the edge at RC 57-58 and the spine at about RC 45. This gave it a hard edge with good retention, but a soft spine that was flexible and less prone to breaking. With modern super steel such methods are no longer needed, and the current version is cut from 80CrV2 sheath steel, a steel with a higher carbon content, as well as some chrome and vanadium. All of it is evenly hardened to RC 59.5. Furthermore, the old pre-2015 versions of this knife had a full flat grind, while the current model instead has a coated Scandi grind. While the blades are sharpened by a master blacksmith who is an old friend and work partner of Cpt. Peltonen’s since 20 years back, he himself makes the leather sheaths by hand. Note also that the version I have tested is a prototype and not the final, new version, but the knife is constantly being revised and improved upon anyways and the final new version shouldn’t differ too much to my prototype version. The shape has much in common with the Finnish m62 bayonet, with a slight drop at the point. The blade is teflon coated to prevent rusting and the spine is rounded, which is great for carving and camp chores. Just like on typical Scandinavian knives, there is no ricasso or choil, with the edge starting right at the grip. Again, this makes carving easy, as the nearest to the hand is where you have the most power to apply. The knife is full tang, with injection molded thermoplastics that both looks and feels like rubber. While completely enclosing the tang, I would personally prefer to have the tang exposed at the back so I could use it for light hammering, and when speaking to Cpt. Peltonen he mentioned he had considered it and that it was his original intention, but technical considerations had forced him to disregard it. He still plays with the thought, but fears it would lead to abuse of the knife, and he may well be right in this, considering the silliness and mistreatment some people put their knives through. 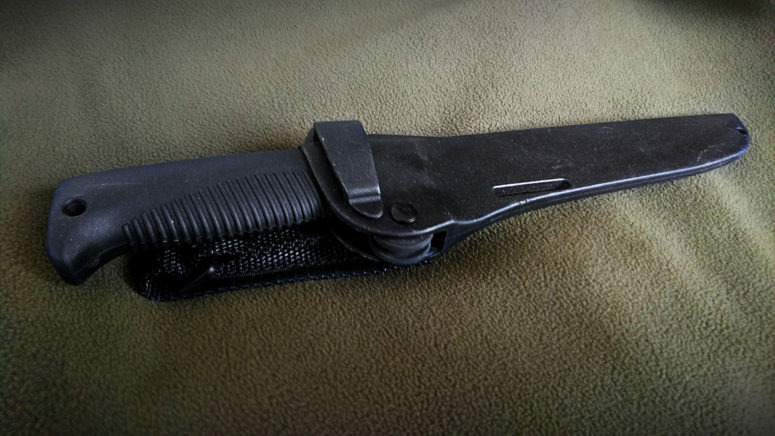 The plastic version of the sheath, with the Rotating Rubber Retention mechanism to secure the knife visible. The sheath itself deserves a special mentioning. It always surprises me how many knife makers manage to botch up the design of their sheaths as it would seem like a simple thing to succeed with, given that good, functional knife and sheath designs have existed for quite some time. In this case however, I am happy to say that it is fantastic as well as innovative. It comes in two variants; 3mm leather (with inner plastic sheath) or fully plastic. Both have a special lock named Rotating Rubber Retention, which is basically a small, flexible rubber wheel inside the sheath which locks the knife in place behind the finger guard once it is pressed in properly into the sheath. It is a brilliant idea that locks it safely even in inverted position, and at the same time it is easy to pull out by pressing the thumb against the sheath. The sheath of course has holes both for water drainage and for adding cord to secure it to your leg or pack. The belt loop has velcro and it can be fastened traditionally hanging from the belt, or from the side of the sheath for hanging the sheath up-side-down on a pack or combat harness. The plastic sheath can also be used both on the left and right side as it is uniform in shape on both sides, and the belt loop can be attached to either side, as can be seen in the picture above, with the loop attachment for lefties visible on the outside of the sheath. So what is it like in use then? As mentioned initially, this has grown to become one of my favourite knives, which says quite a bit about it, considering I have had great opportunity to try out a lot of very high-quality knives by top brands in Europe and the US. It is very comfortable to use regardless of season with no cold metal exposed in the grip, despite the full tang. Having some fun carving an idol of old One-Eye with the Sissipuukko. Both the blade and grip are well-designed for outdoors chores like preparing firewood and food, while the blade is thick, sturdy and long enough even for batoning logs. The blade is very sharp and the edge retention is really good, meaning you won’t have to sharpen it very often. Scraping tinder chips from fatwood works beautifully and even quite delicate carving is a breeze, as is chopping quite thick sappling. No finger guard at the spine also makes it wonderful for carving as you can place the thumb on the spine. The ridged grip gives a good and firm grip, even when wet, and using any of the common carving grips, pressing against the spine, flats or reversing the knife works easily and comfortably. The curved shape of the ends of the grip means it is easy both to push forward and to pull out again. Basically everything about this knife and its sheath seems quite optimal for everyday chores when out in the woods and I really don’t have any complaints at all about it. Perhaps exposing the tang and adding a hammering piece at the end would be neat, but it is really pushing it just to find something to change and it really isn’t needed. Note though that the coated Scandi grind is a bit deceptive as you really can’t sharpen it as an uncoated Scandi grind without removing the coating. As such, an uncoated variant would have been nice. Also, the belt loop with velcro is a wee bit cumbersome if you, like me, have a habit of putting on and removing the knife from the belt several times during the day. And if the future involves more experimentation, a version with a different tang and micarta scales could be an interesting alternative for some. Perhaps something similar to the first knife Cpt. Peltonen made. 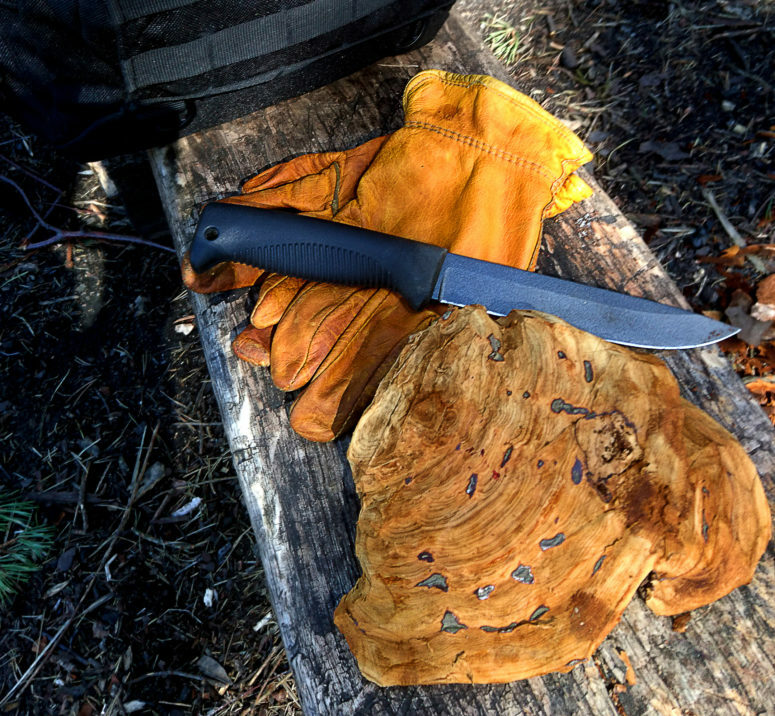 While knives designed for bushcrafting tend to be a bit more specific in purpose and consequently best at specific tasks, survival knives are intentionally not great at anything, but good enough at most things. This knife, however, breaks that mold with its great versatility and is really quite excellent at all the tasks I use it for. I am extremely pleased with it, not least considering that it costs about half to a third of equivalent knives which still don’t quite manage to handle as well as this knife does. Great review Roger. I have one of these, in fact I only own 2 real knives these days (the M95 flat grind and the “mighty” Fallkniven F1) and when this trip is over in six weeks time I shall swap the F1 for the M95 for a year or two. I am really looking forward to it. I have used the M95 already and I too don’t love the belt loop strap, find it a bit bulky myself but it does allow attachment to certain softshell pants I have that have their own built-in belts and of course, my rucksack, if that is your thing, I imagine it is a soldiers thing. I shall see how my relationship with it develops over the coming months and see if it can hold a candle to the almost perfect F1 (for me and my uses, of course).